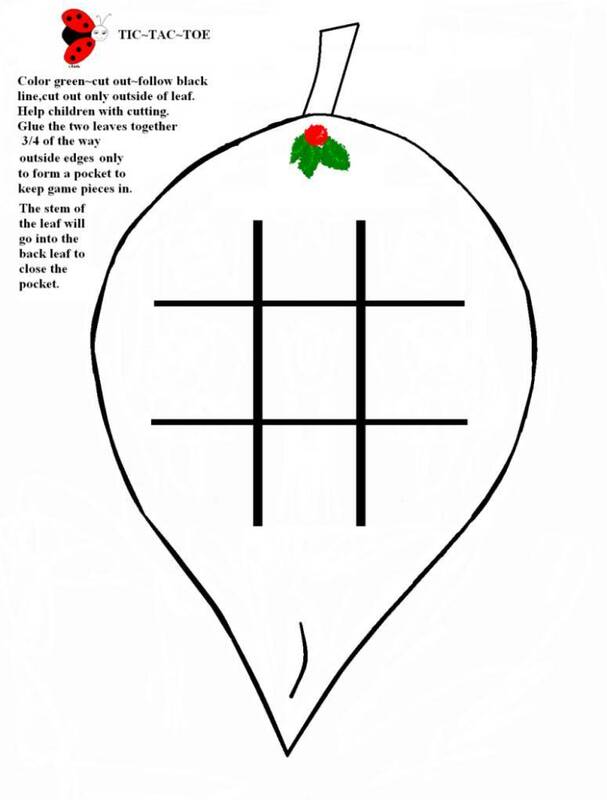 Print a holiday ladybug version of tic-tac-toe to keep your children or young visitors busily creative, or to engage younger students as the holidays approach in the classroom. The full-size game sheets are available as a free download of images which you are most welcome to print out for yourself, or to print multiple copies for your children, students or youth groups. We ask that you please do not link to these large image files directly, or republish them on your blog or website as this violates copyright law. It also uses up our hosting bandwidth and slows our entire website down. 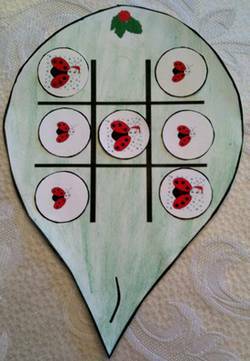 Please link to this Printable Ladybug Tic-Tac-Toe Page if you would like to share with others. First, print and cut out a copy of the Front Ladybug Game Piece, (a smaller version of which is shown at left). You will also need to print and cut out the matching Back Ladybug Game Piece. Have the children color the front game piece in green before cutting it out just outside the black outline. An adult must help with the cutting if the children are too young to do this part safely for themselves. Next, print and cut out the Ladybug Game Pieces. You can see a small sample of the two different game pieces at right. You will print out five of each kind on one page. Now glue the edges of the main front game piece to the matching back, going about three-quarters of the way around, and leaving the tops open to insert the ladybug game pieces when the game is not in use. Give one player a matching set of five ladybug pieces. Give the second player the other matching set. Players take turns to play, setting one game piece down for each turn. The player who is first to get three matching ladybugs in a row is the winner. The ladybugs can line up vertically (on any of the lines going up and down), horizontally (any of the lines across), or diagonally (from one corner, across the middle, to the opposite corner).